Sonning Parish Council, as a consulter, receives copies of planning applications submitted to Wokingham Borough Council that relate to Sonning and some from adjoining Parishes where the development is close to the Sonning boundary. Applications are allocated to one or more Councillors on the Planning Committee, who visit the site and discuss the proposal with neighbours. Recommendations and observations are brought to Planning Committee meetings. Planning Meetings Information about who sits on the committee; their responsibilties; and the agendas and minutes of their meetings. Planning News & Updates What's happening on the planning front and access to the WBC Planning Applications database. An Overview A brief guide as to how the Council affects planning permissions. Conservation Area Assessment Sonning was was originally designated a Conservation Area in 1971 and a Study was done 1996. 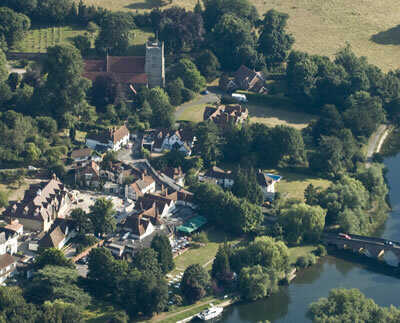 We are currently working with the Sonning & Sonning Eye Society to re-examine the area and produce a revised document. Sonning Design Guide The Sonning Design Statement was created in 2004.